And listen they most certainly did. Having barnstormed the Fringe with technically audacious and occasionally frank hours such as Cheese and Crack Whores, Waiting for Gaddot and Breaking Gadd, the Fife-born comic took a deep breath, ditched the puntabulous titles and plunged face-first into a deeply personal show. The trigger for Monkey See Monkey Do was the sexual assault he suffered at a party four years previously and his continual struggle to cope with that trauma. For most of his hour in a claustrophobic room at the Banshee Labyrinth, Gadd ran on a treadmill with images being screened behind him as his inner turmoil (represented by an ape we often heard and sometimes saw) plays merry hell with his everyday dealings. At the end of an exhausting August, both physically and mentally, Gadd's efforts royally paid dividends when he held off competition from the likes of James Acaster, Zoë Coombs Marr and Nish Kumar to win the Edinburgh Comedy Award. By doing so, he became the first Scottish victor of the biggest prize in comedy since Arnold Brown scooped the Perrier in 1987 (that is, unless you consider Canadian Phil Nichol to be a Caledonian winner; though only people who argue David Byrne is Scottish would pursue that line). 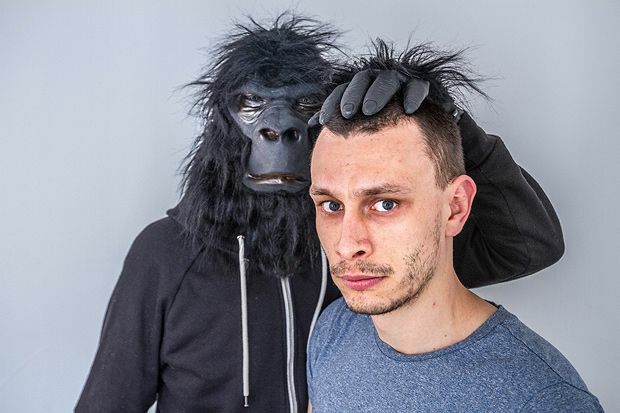 Monkey See Monkey Do plays at the Soho Theatre, London, until Sat 12 Nov.
Edinburgh Comedy Award winning show from the Fife-born performer.